The New York Times on Thursday ran an article about the latest Democratic line of attack on Supreme Court nominee Brett Kavanaugh without bothering to contact the man at the center of the story. The Times reviewed emails that Kavanaugh sent as a White House lawyer in the George W. Bush administration during the confirmation process for Charles Pickering Sr., and outlined Democrats' contention that Kavanaugh may have misled Congress when he said he did not "primarily" handle Pickering's confirmation for an appeals court seat. National Review senior writer David French, an accomplished attorney, contacted Pickering, however, and found out the Times never reached out to him for the article. What the article did provide was Democrats' point of view that Kavanaugh did not testify truthfully to the Senate in 2006 when he said Pickering was "not one of the judicial nominees that I was primarily handling." Senate Minority Leader Chuck Schumer (D., N.Y.) accused Kavanaugh of leading "critical aspects" of that confirmation fight, but Pickering told French he did not even know who Kavanaugh was at the time. "While I worked with attorneys in the White House Counsel's office, I cannot recall a single interaction with Brett Kavanaugh about my judicial nomination. I do not even remember knowing his name at the time," Pickering told French. "His 2006 testimony is accurate." The email record shows Kavanaugh did not have a leadership role in Pickering's confirmation. The Times story could only marshal minor actions as evidence of Kavanaugh's involvement, such as reserving rooms for events, drafting letters, and assembling binders of information. Pickering's confirmation process was long and complex, since he was blocked in committee, filibustered, and ultimately became a recess appointment. Pickering told French he recalled various people who had important roles during his confirmation, but Kavanaugh was not one of them. The Times, however, quoted Democratic Sen. Dianne Feinstein (Calif.) saying Kavanaugh "led on key parts" of the nomination. A new Quinnipiac poll released Wednesday found a plurality of respondents support Kavanaugh's confirmation. White House deputy press secretary Raj Shah told the Times that Democrats' attacks are "increasingly desperate and baseless." French, who supports Kavanaugh's confirmation, agreed with that sentiment. "The email trail shows that he was a bit player in a much larger drama. The rest of the available evidence confirms that he did not mislead the Senate," French wrote. "Once again, the Democrats have taken their swing at an outstanding nominee. Once again, they've missed." Kavanaugh's confirmation hearing is set to begin September 4. 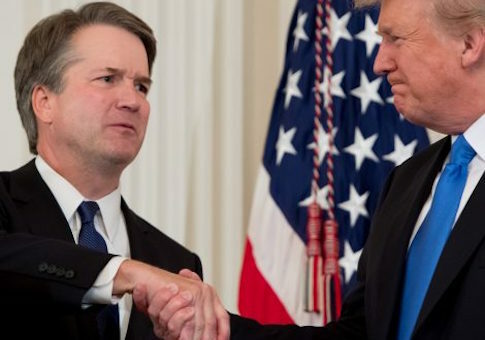 Earlier this week, Kavanaugh met with all three Democratic senators who supported President Donald Trump's previous Supreme Court nominee, Justice Neil Gorsuch. This entry was posted in Issues and tagged Brett Kavanaugh, Chuck Schumer, Democratic Party, Dianne Feinstein, Supreme Court. Bookmark the permalink.